While collecting marketing data is easy, that data is not cast in stone. For example, nearly 50 million people change jobs every year. Furthermore, 68 percent of people lie when they’re filling out registration forms. Phone numbers and email addresses are changing constantly. What does this mean? Figuring out the quality and accuracy of your data is of the utmost importance, especially considering the fact that you’re likely to base your marketing decisions on the data you have on hand. And that’s where securing a marketing data management plan that you can rely on comes in to play. 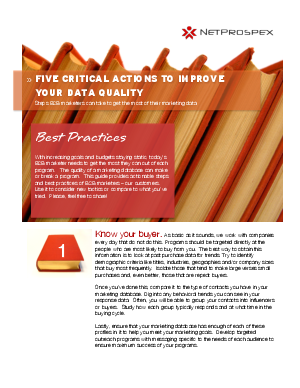 This guide provides actionable steps and best practices of B2B marketers – our customers--to clean up your data through ongoing data management can increase conversions.